Book. DVD. 22 min. Color-sound. This video shows real and fake-acted footage, in a narrative way that depicts the whole situation of my convenience marriage. It goes with an information book that compiles application forms, passport photocopies, receipts, photos, the marriage certificate and other related documents. 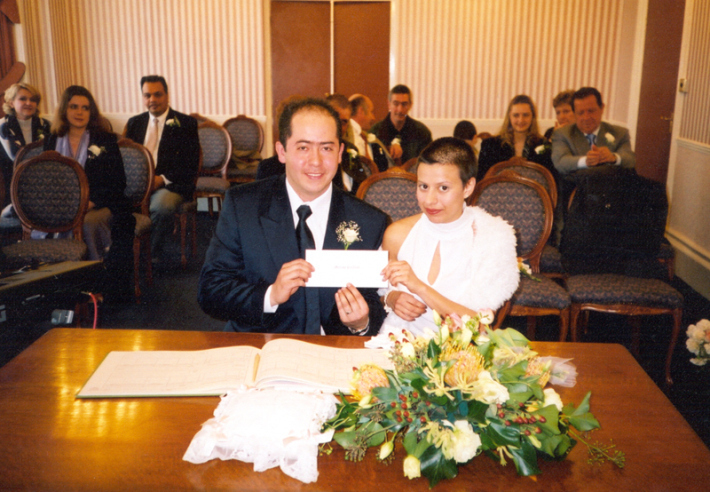 The 9th of March, 2002, I married Javier Mancera, a close friend in London, to give him the British resident Visa. We made business, I married him as the English woman I am, and facilitated all my papers and myself for the process. In return he gave me 3000 pounds. We celebrated our union at the Redbridge Register Office, and then had a small party at the Doctor Johnson Pub. The 5th of August, 2002, Javier received his temporary British residency, and since then he can work freely in the UK. The 1st of July, 2003, Javier’s passport was stamped with his British residency, and now he can stay indefinitely in the UK. At the moment, Javier is applying for hisBritish passport to nationalize himself as a British-European. I would get married again, if I could do it this way, and this video is certainly an invitation to do so.